Nassau Police Commissioner Patrick Ryder and Suffolk Police Commissioner Geraldine Hart said data analysis and intelligence gathering are also responsible for declines in most major crime categories. Nassau and Suffolk police are using technology to target guns, gangs and drugs to continue to push down crime in both counties, according to Long Island’s two top cops. Nassau Police Commissioner Patrick Ryder and Suffolk Police Commissioner Geraldine Hart said in interviews that data analysis and intelligence gathering are also key elements in maintaining low crime rates. 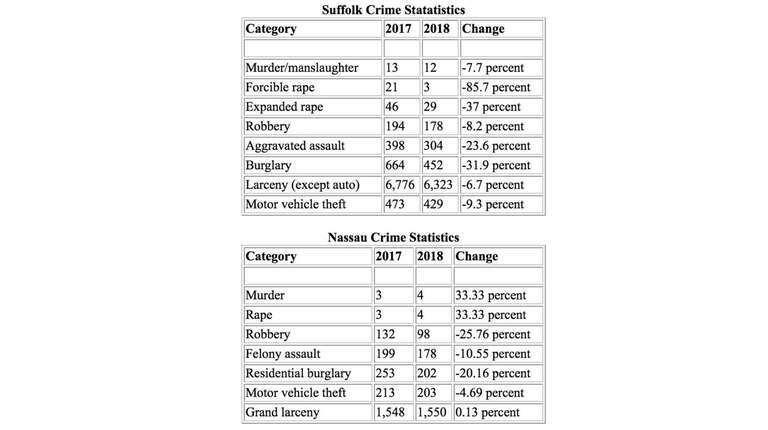 In the first six months of 2018, Suffolk reported a 10 percent decline in major crime categories; Nassau had a 4.76 percent drop compared with the same time last year. 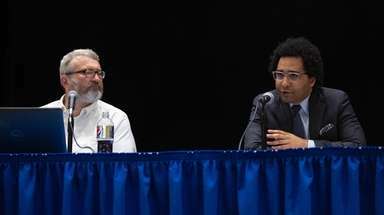 Hart and Ryder said both departments use computer technology such as crime mapping — a system that keeps track of crimes in real time — to identify hot spots where crime is spiking. “We are able to look at crime statistics, look at our real-time crime mapping and see where we need a push for personnel,” added Hart, a 21-year FBI veteran who took the helm of Suffolk's department April 9. In addition to Suffolk's overall crime drop, homicides were down from 13 to 12 compared with the same time last year, while property crime — like burglaries and robberies — fell 9 percent. 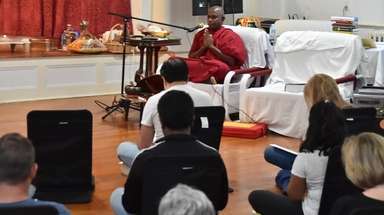 Forcible rapes declined 85.7 percent, as three were reported in the first six months of this year compared with 21 over the same period last year. Aggravated assaults dropped more than 23 percent, from 398 to 304 in the comparable period this year. Along with the 4.76 percent reduction in Nassau's major crimes, felony assaults decreased more than 10 percent, from 199 between Jan. 1 and July 2 in 2017 to 178 during the same period this year. Residential burglaries dropped more than 20 percent, from 253 to 202, and vehicle thefts decreased 4.69 percent, from 213 to 203. Nassau police investigated four homicides during the first six months of the year, compared with three in the same period last year. There were four rapes reported from Jan. 1 to July 2, compared with three by this time in 2017. 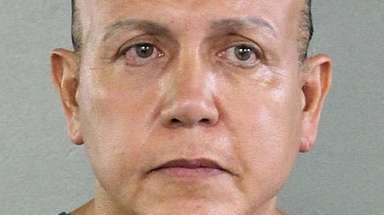 And grand larcenies — the crimes most frequently committed by opioid users to finance their drug habits — were virtually unchanged with a 0.13 percent increase to 1,550 from 1,548. Nassau and Suffolk police augment technology tools with information gathered through community tips, informers and search warrants to identify areas the department needs to target for beefed-up enforcement, Ryder and Hart said. “A great example of targeted enforcement for us is the Firearms Suppression Team, we call it the FAST team,” said Hart, referring to a crew of police officers and detectives charged with reducing the number of illegal guns on the streets, especially in areas with high crime rates. In Nassau, technology known as ShotSpotter — microphones placed in high-crime areas that pick up the sound of gunfire and alert police to the locations of shootings — have helped Nassau police tamp down gun violence. For example, there were 377 shootings in the Roosevelt-Uniondale area in 2010, Ryder said. MS-13 remains a concern in both counties, but the commissioners say the focus on crime mapping, intelligence gathering and other strategies has dealt a blow to the gang. 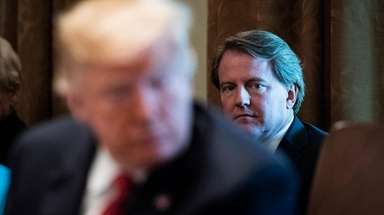 President Donald Trump — who has traveled to Long Island twice since taking office to decry MS-13's violence — said during a June 20 rally in Duluth, Minnesota, that his administration has “liberated” Long Island towns from MS-13 gang violence. Ryder said that while the gang continues to fuel fears in some Nassau neighborhoods, the president overstated the gang’s presence. 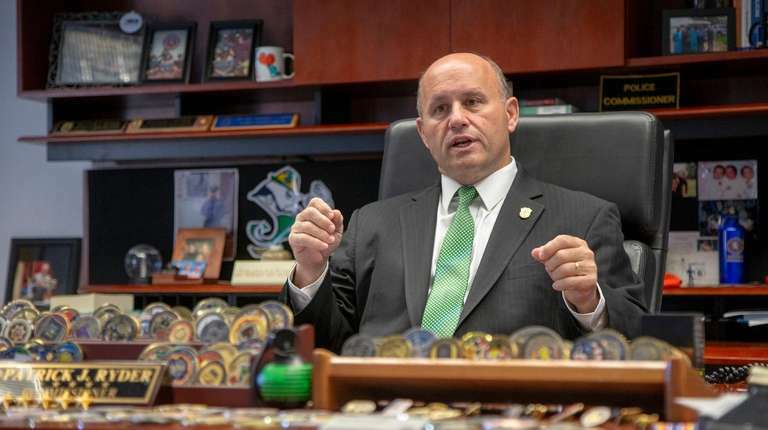 Hart, meanwhile, said Suffolk police continue to share intelligence and work closely with the Drug Enforcement Administration, the FBI and other federal agencies to combat MS-13. That cooperation now extends across international borders. Hart and other metropolitan area law-enforcement officials traveled to San Salvador in January to discuss anti-gang strategies with officials from El Salvador’s national police force. “They [MS-13 leaders] are conveying orders from El Salvador to people here on Long Island, so it is just smart policing to make sure you are hitting the shot-callers down in El Salvador as well,” Hart said. Nassau County Police Commissioner Patrick Ryder in his Mineola office in September 2017. 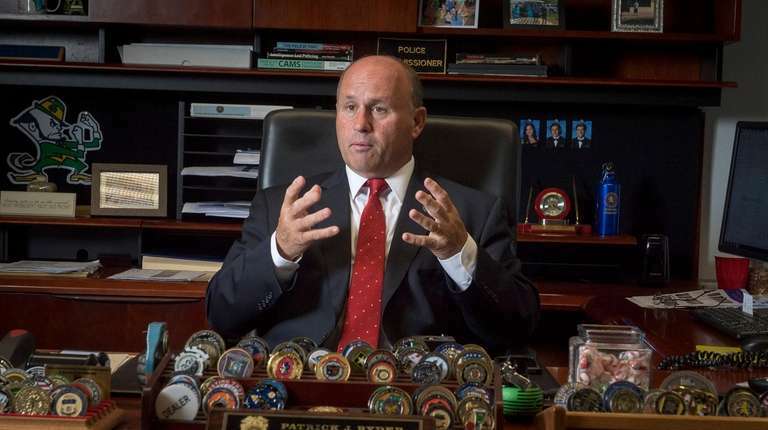 Photo Credit: Newsday / J. Conrad Williams Jr.
Hart and Ryder said they’ve also made strides in their war against illegal opioids use, with both departments rolling out strategies to slash supply and demand. In Nassau County, police have used mapping technology to identify at-risk neighborhoods by linking opioid overdoses with thefts from automobiles, which officials say is the most common crime committed by opioid addicts. The department then intensifies enforcement in those areas. Scores of drug dealers have been arrested in East Meadow, Baldwin, Massapequa, Hicksville and other communities since the project — called “Operation Natalie,” after Natalie Ciappa, a Nassau teenager who died from a drug overdose 10 years ago — was initiated this year. As a result, Ryder said nonfatal heroin overdoses have dropped by one-third countywide since Operation Natalie began, compared with the same period last year, thanks in part to town hall meetings organized by police and addiction experts in communities that have been targeted to provide residents with information about drug treatment and prevention. Fatal overdoses are harder to measure, Ryder said, because they need to be reviewed and classified by the medical examiner, a process that won’t be completed for this year until the first few months of 2019. Toxicology tests confirmed opioid overdoses killed 421 people in Nassau and Suffolk counties last year. In Suffolk County, police launched a program in 2015 called “The Ugly Truth” that also sponsors drug prevention forums in schools and teaches people how to use naloxone, the drug that reverses overdoses, Hart said. 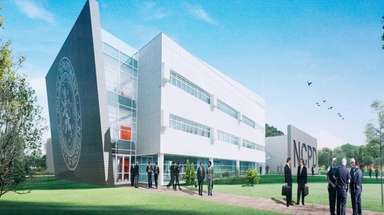 Suffolk police are also tackling the opioid crisis through a treatment referral program called Preventing Incarceration Via Opportunities for Treatment, or PIVOT. Suffolk police officers identify suspected drug users and turn in their names to the Long Island Council on Alcoholism and Drug Dependence. LICADD counselors then contact the drug users and offer assistance to get them into a treatment program. 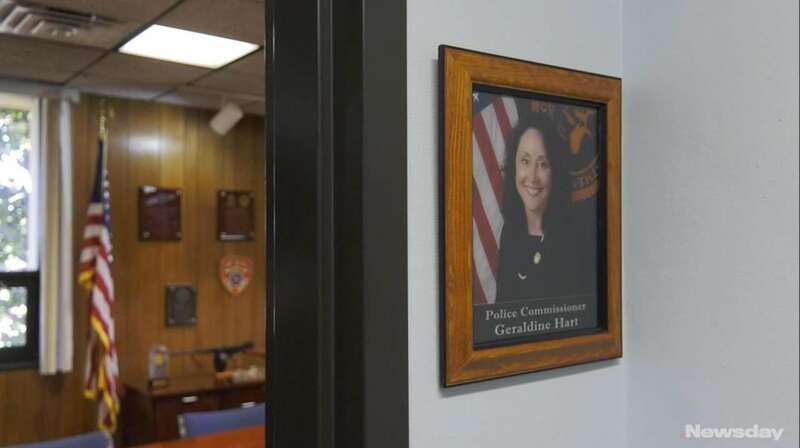 PIVOT began as a pilot program in the Sixth Precinct, but Hart said officials have deemed it a success and are eager to expand it to the rest of the department’s jurisdiction.